Eighteen-year-old Rachel Fullsmith has returned to Kenya after a six-year exile following the death of her mother. But the colony to which Rachel is returning is significantly changed from when she was twelve. Her father is now living with another woman and her son; her childhood friend, a Kikuyu boy named Michael is now a grown man, and the tone of their relationship is much darker and more intense; and it is 1952, and the Mau Mau are rebelling against the British Empire, openly fighting with soldiers and killing English farmers and their families as they sleep. 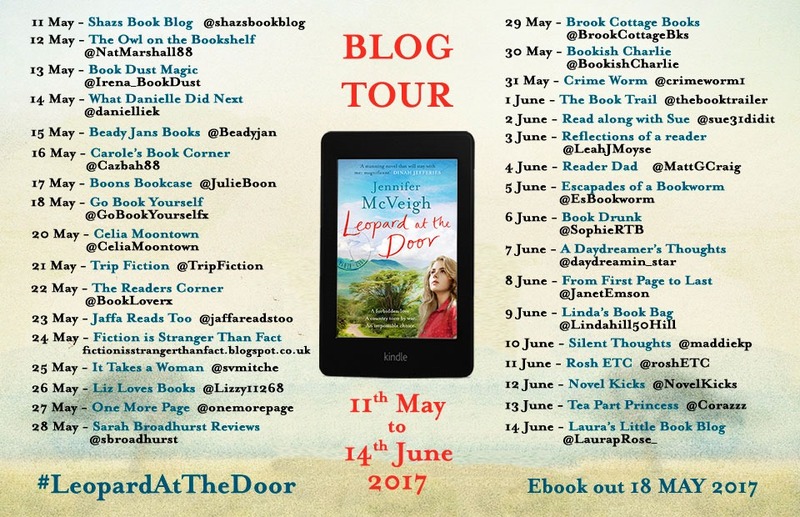 Not everyone is happy to see Rachel back in her childhood home, and as tensions grow within the wider community, so too do the tensions between Rachel and her father, and the other strangers who now live in the place she once called home. Leopard at the Door is another one of those books that doesn’t, at first glance, look like the type of book you normally see here on Reader Dad, but once again it’s the examination of the darker side of the human condition that drew me to this one. Rachel Fullsmith’s story plays against the backdrop of a time of great upheaval in Kenya, as native forces begin attacking the British occupiers, both the soldiers and the settlers, while at the same time fighting a brutal civil war. The changes in Rachel’s life, and the enmity that she finds in the place she once called home add a further layer to this backdrop so that it’s difficult to determine whether we should be more worried about the Mau Mau on the outside, or from the so-called friends of her father who are now regulars at the farmhouse where she grew up. Rachel is, herself, not a particularly likeable character, a bit too much of the rich spoiled brat to be wholesome and a bit too much the damsel-in-distress stereotypical 1950s-woman-in-Africa. With few exceptions, however, she is the character for whom we feel the most empathy, especially when we discover what awaits her in the Rift Valley, where she spent her formative years. Her father has moved a new woman into the house, a woman he has failed to mention in six years of correspondence, and her familiarity with the local district officer immediately sets Rachel on edge. Her father’s coldness, and seeming disinterest at her return do little to make her feel welcome, and so she seeks solace in the people and routine of her childhood – the local native village which provides much of the house’s servants and workers has also changed, as have the attitudes of the white settlers to these natives who were once taught and nursed by Rachel’s mother, who were essentially part of the family, despite the social and racial differences that separated them from their English employers. Where McVeigh excels is in her ability to evoke Kenya of the early 1950s, from the feeling of oppressive heat, through the danger of sharing this piece of the planet with dangerous animals (leopard are not the only thing at the door, as we encounter elephants and lions during our visit to the Rift Valley), to the political dangers of occupying a land whose natives want it back, and will stop at nothing to take it from you. The tensions between the English and the Kikuyu are particularly well rendered, and we feel the shock of their reality as we discover them through Rachel’s eyes: here are tensions that did not exist six years earlier, racist attitudes and a feeling of supremacy that would have been unheard of when her mother ran the house. This forms the solid core of the novel around which al else feels, at times, almost incidental. As the story progresses, and the threat of violence becomes ever more real, Rachel’s grip on what should be begins to falter, and she finds herself questioning everything. The reader becomes her only witness, powerless to help her despite the overwhelming desire to shake her and force her to see the reality of her situation. The result of her doggedness to believe in her father leads to scenes of horror that are so intense they leave the reader almost breathless. These are the scenes that will stay with us long after we have finished the book, regardless of what comes after, and it is this that elevates Leopard at the Door from merely good fiction to something excellent and frighteningly insightful. 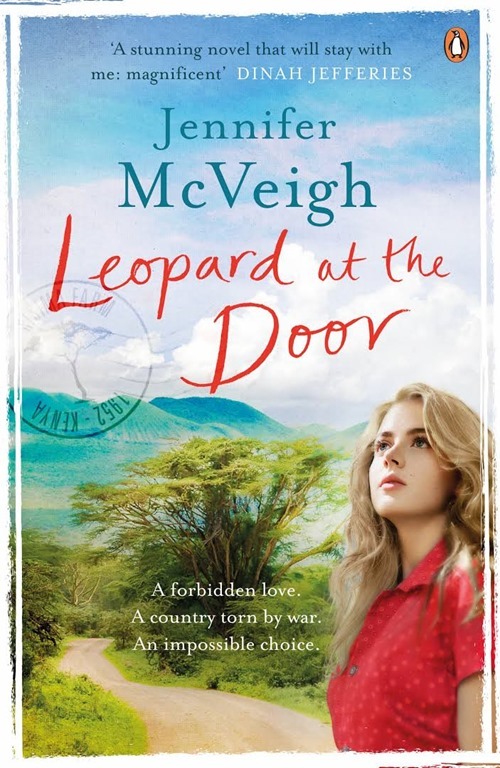 Jennifer McVeigh takes us on a guided tour through Kenya in the latter days of its status as British colony and, in so doing, examines the concept of human relationships on every level from the microscopic to the microcosmic. Insightful and at times disturbing, Leopard at the Door is a book that works itself under the reader’s skin, making it one of the more memorable books you’re likely to read this year, even if it’s unlikely to find its way into your list of favourites. Either way, it’s certainly worth the effort.